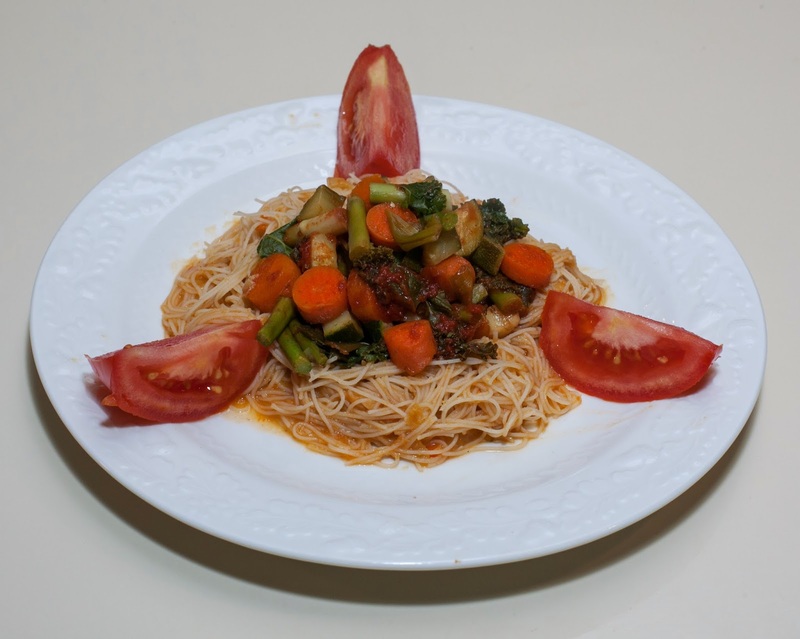 I came up with the idea of pressure cooking vegetables and serving them in a brown rice noodle nest. I had never pressure cooked asparagus, and was curious to know how it would come out. I was originally going to include seitan in the recipe, but instead mixed the Turkish lentil soup that I made two days ago. Here is what I did. I put all of the ingredients except the lentil soup, soy sauce/salt/hot sauce, and noodles, into my Instant Pot and cooked at high pressure for 3 minutes. In the meantime, I set a large stock pot of water to boiling, then reduced the heat and added the noodles, stirring occasionally. When the noodles were cooked in just 2 or 3 minutes, I drained and rinsed, and mixed in the lentil soup. I made a noodle nest on each plate with a hollow in the center, and served the pressure cooked vegetables atop. Dinner was tasty! I was pleased with how mixing the lentils with the noodles came out. The vegetables all tasted good! I'd like to continue to explore combining soups like lentil with noodles, rice (like kicheri), or pasta. All of my experiments with pressure cooking vegetables have been great! 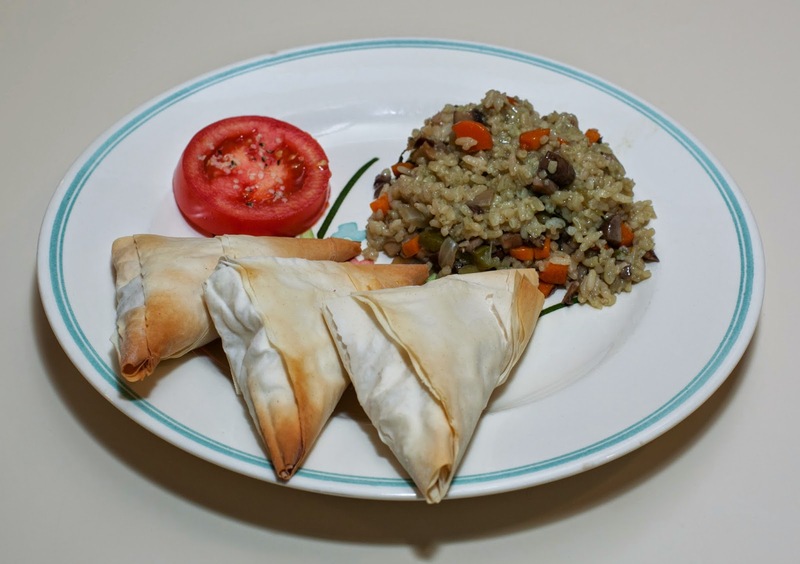 Recently, my family went out to eat at a Turkish restaurant that we like, Talulla's (we love their warm hummus and many other dishes that they make). We had a pureed red lentil soup that was quite good, and I've had it on my mind to learn how to make something like this. Half of the soup is then pureed and mixed back in to come up with a mainly smooth soup with some small chunks. The recipe calls for optionally serving with lemon wedges and chopped mint; I put a leaf of mint in the bowl and a chunk of preserved lemon. I also made a pressure steamed and then stove charred "baked" potato, as per an Instant Pot recipe. The recipe calls for putting 2 cups of water into the Instant Pot pot, putting baking potatoes into a smaller bowl set atop the Instant Pot's steamer rack, steaming on high pressure for 25 minutes, and then flame charring the skin. My Dad didn't eat with us today (he was with friends), so I was free to use the garlic, which contributes an important taste in this recipe. All three of us - my Kindergartener, wife, and myself, loved the soup! I recall the restaurant's one as being a bit better, but my wife wasn't sure and also suggested that they probably had oil in theirs, adding just a bit more luscious flavor. I already increased the spices that the soup recipe had called for, but it could perhaps use maybe 3t of ground cumin, an extra 2 cloves of garlic, and possibly a third carrot. To deepen the red, a bit more tomato paste could be used - perhaps a total of 3T - but not so much as to lend too strong of a tomato flavor. The mint and lemon were great! While I didn't use cayenne, my wife and I added hot sauce at the table, and that was quite welcome. Were I not cooking for spice-averse people, I would try a teaspoon of chopped jalapeno instead of cayenne. Small chunks of asparagus would go well with this soup. I would love to reinvent this soup by incorporating kale, though the color would change to a less appealing brownish one. I could change the character of the soup by serving with chopped raw bok choy and perhaps chunks of cooked squash. The soup was great in consistency, but instead of using a 1 part lentil to 6 part water ratio, would be just fine 1 : 4 of 1 : 5 for something more thick. The potato was good. We ate it as-is without added fat. I think that the potato could be done a bit more, so might cook for maybe 28 minutes next time. Incidentally, I chose not to pressure cook the main course because red (split) lentils take 15-18 minutes to cook under pressure, not much less than 25 minutes on the stove. I could have made it all in the Instant Pot, and perhaps should try sometime. As I was researching and writing this up, I noticed that Talulla's calls their soup Mercimek Soup. I guess this traditional soup is known in Turkey as Mercimek Çorbasi. One recipe suggested incorporating sauteed potato (I presume cut into small cubes, perhaps 3/8" in size) as well. I can't wait to make some version of this again, perhaps in the pressure cooker and with more / with no garlic, depending on whether my Dad is visiting. As I described earlier this week, I've been thinking of cooking with pears in the pressure cooker. I had some leftover pumpkin from that earlier meal, and used it for tonight's dinner. I put all of the ingredients into my Instant Pot. I have never used the timer feature and actually put the ingredients in a few hours before dinner, and had it start after two hours (timing is not so critical as the unit goes into a keep-warm mode once done) and then run for 3 minutes under high pressure. Then I served - simple! I also made a Madagascar Pink rice dish with onion and small pieces of broccoli. Wow, the main course was excellent! It's amazing what three minutes of pressure cooking can do. This was one of my favorite meals in the recent past. We all enjoyed it. The pear worked better than I dared hope - if a cube was eaten by itself, one may recognize it as a pear. But in the dish, it really contributed some subtle undertones and a bit of moistness. My hunch to try pear was a good one. The broccoli went great with the rice, as well. I'd like to explore more dishes with pear as a side note - and, for that matter, other fruits, like perhaps Asian pear, banana, or kiwi. Tonight's meal was a winner! I teach photography many Thursday nights and usually stop to eat out on the way home. 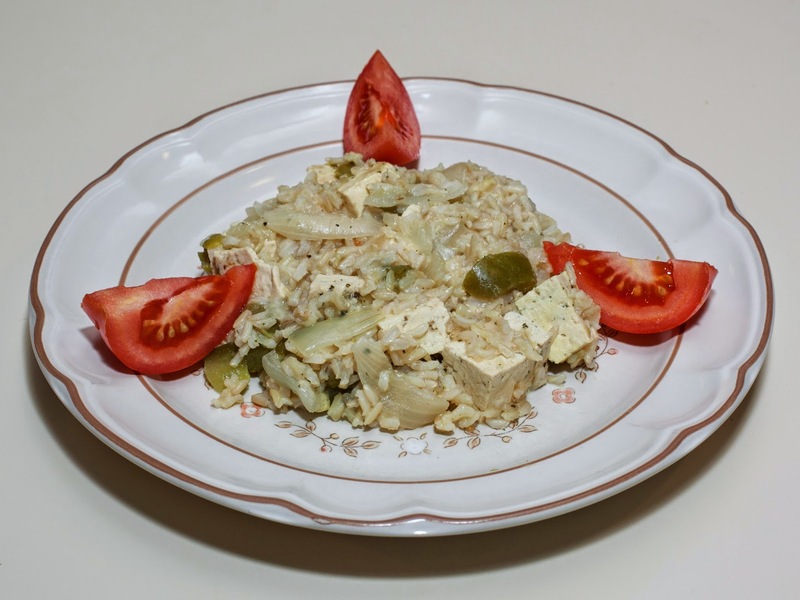 Tonight, I had a desire for a tofu dish; since my wife, who doesn't eat tofu (she can't digest it well) and the rest of the family had eaten, I decided to try a simple tofu and rice dish in the Instant Pot pressure cooker and use this opportunity to try cooking rice under pressure; I picked up some medium grained brown rice. Back in July, I enjoyed my experiment with 3-minute pressure cooked tofu. But I wanted a simple dish with one cooking time. I knew that the ingredients other than the rice may be overcooked, but I decided to add all the ingredients and cook together. A site called Simply Daily Recipes describes cooking with the same ratio for 22 minutes, letting it stay for another 10 minutes in the default "keep warm" mode, then releasing the remaining pressure slowly and serving. Less cooks in 20m - but would this cook fully? More soaks the grains for 45m then pressure cooks for 60m, and is recommended "for harder grains such as dry split corn" (I'm not familiar with dry split corn.) It's neat that grains can automatically be soaked! I decided to try the second approach, but am intrigued about the 20m third approach, and will have to try it sometime. I put all of the ingredients into the Instant Pot pressure cooker, stirred, and cooked on high pressure for 22 minutes. Dinner was good! The rice was cooked nicely to a welcome fluffiness, and there was no sticking to the instant pot surface, for easy cleanup. Surprisingly, the tofu and vegetables didn't seem to suffer by the extra cooking, though I'd prefer the pepper less soft. I was also surprised that the rice, while quite nice, had a few kernels that were a bit undercooked and crunchy. I hesitate to add much more cooking time without more liquid as the liquid was just fully absorbed without any rice sticking to the pot. The tradeoff of being able to cook everything at one time is well worth the soft peppers, in my mind. I don't understand why the tofu didn't really degrade with longer cooking. Next time, I think I'll try one or two more minutes of cook time. I was thinking of adding jalapeno, but am sending some with my daughter's lunch tomorrow, so kept the dish from being spicy. I did add some hot sauce at the table. I should explore making similar dishes in the future with a bit more flavor, such as with Brussels sprouts or other vegetables, and with some turmeric, perhaps. I was delighted to have my Kindergartener daughter help in designing tonight's dinner. I had the idea of an autumn meal, blending some sweetness of pears into a savory dish, using my pressure cooker. I love winter squash, but my daughter doesn't. Pumpkin is similar but I rarely cook with it - and I was hoping that the excitement of the seasonal Halloween vegetable might excite my daughter to enjoy it. I was going to pressure cook pear, pumpkin, and onion (and garlic if my Dad weren't visiting) for 3 minutes, then mix in seitan. She liked the idea, but suggested cranberry beans instead of seitan, and wanted kale. I ended up not using pears, but want to try pressure cooking pears with perhaps pumpkin or some other vegetable sometime soon. Here is what I did. The Instant Pot has a convenient "bean" button that cooks beans for 30m at high pressure; my wife rinsed the beans and put them in the pot, adding just enough water to cover them, along with the bouillon cube, and used the bean button. That should have nicely cooked the beans, but my wife had ended up stacking several items in the pressure cooker, which I've never done - and the beans, even at 30m weren't done. I cooked them for another 8m. After a few minutes, I gently let out the pressure and added the pumpkin, onion, kale, and half cup of water, stirred, and cooked for 6 more minutes. I believe that all would cook in 3 minutes, but I wanted to be sure that the beans would be done as they were still a bit harder than I'd like. I waited a few minutes, then slowly let out the heat and opened the pressure cooker. I mixed in the salt and cumin, then served. I quite liked the main course, though the pumpkin indeed was essentially pureed. The pumpkin skin was intact but softened, and was good to eat. I liked the dish; my daughter and wife ate it and liked but didn't love it. I wasn't surprised about my daughter, as she doesn't like squash. While I liked how the pumpkin made the dish, I may have to come up with different ways of preparing pumpkin to satisfy my family. Garlic, ginger, and a bit of jalapeno would be good. I suspect that some turmeric and raw onion mixed in at the end would be beneficial. My daughter had vacation last week and I had planned on getting away for a few days to the mountains (my wife had to work), but we had rain forecast. I taught Thursday night and then took advantage of a small window of time to get away to the beach Friday for one night. I had to get back as today was the first annual Triangle Vegfest and I was the opening speaker. What a great festival! I had nothing to do with organizing this - there was a very well organized person who put it together so well, with speakers like Gene Baur, Karen Davis, local slow-cooking author (what a nice blog!) Kathy Hester; outdoor activities including live bands; many vendors; food demonstrations; yoga classes; and more. We got home with a tired kiddo; I made a quick meal for her while I prepared a bean soup. It is suddenly a bit cooler today, and I was in the mood for a hearty bean soup. Sometime soon I'd like to make a multi-bean soup, but for today I worked with cranberry beans. I didn't have any soaked beans, so increased the cooking time from 20-25 minutes to 28 minutes. Initially, I had thought of cooking in two parts, adding vegetables like carrot and some greens for a second 3-minute high-pressure cooking, but decided to use broccoli stalks chopped fine and perhaps overcooked bell pepper strips and rely on the flavor, particularly of the stalks, to just do one cycle (of course, onion was included; if my Dad weren't visiting, I'd add garlic). Here is what I did. I also made some mashed potato and served a salad. The soup was good but the beans were still a bit firm. My wife ate it as it was, but I put the pot back in (including the additional ingredients - I should have also added a carrot sliced into maybe 3/8" thick slices) for four more minutes. At this point, my Dad and I really enjoyed the soup. It was surprisingly a bit spicy - this batch of chili powder must be quite hot. The bell pepper wasn't mushy but was plenty soft, and went well with the other ingredients. I would go with 32 or even 33 minutes of cooking time next time, unless I soak the beans, in which case 22-24 minutes would be enough, as I've done in the past. A full cup of beans would have been welcome, and carrots cooked for 3 or 4 minutes would be nice. Barley may go well with this soup, as well as fennel (maybe 2T fennel root cut into 1/4" cubes and cooked with the beans; perhaps some fennel fronds could garnish the soup) and a bit more shallot (5T?) or raw onion at the end. This is a good soup! I love cooking with cranberry beans. I soaked a cup of them overnight and wanted to make a dish with fennel. On Wednesday, I had soaked some cranberry beans and was planning on pressure cooking them for 20-25 minutes as the main part of a dish the next day. However, I had a new Food for Life series beginning on Friday and was out with my daughter shopping (and then eating at the store) Thu. The beans were patient! After being soaked overnight at room temperature, I drained the beans, covered, and stored in the refrigerator. They were fine for using today - I just rinsed once more then put in the Instant Pot pressure cooker, put enough water in to just cover the beans (keeping the volume well below the halfway point of the pot), then cooked on high for 20m. Here is what I made tonight. I let the pressure come down then slowly released remaining pressure, mixed in the shallot, second batch of onion, oregano, 1/4t of salt (I used the nice finishing fleur de sel that we just picked up after being without it for over a year! ), and 1/4 t black pepper. I served the bean dish with the fennel fronds as garnish. I also made Jade pearl rice with bell pepper and onion (first sauteeing the vegetables briefly and then adding about 2/3 cup rice and 1 2/3 times, or just over a cup, of water plus a vegan bouillon cube, and simmering for 20m). I mixed in about 2T of nutritional yeast and a little salt to the rice before serving. Heirloom tomato sprinkled with hemp seed completed the meal. 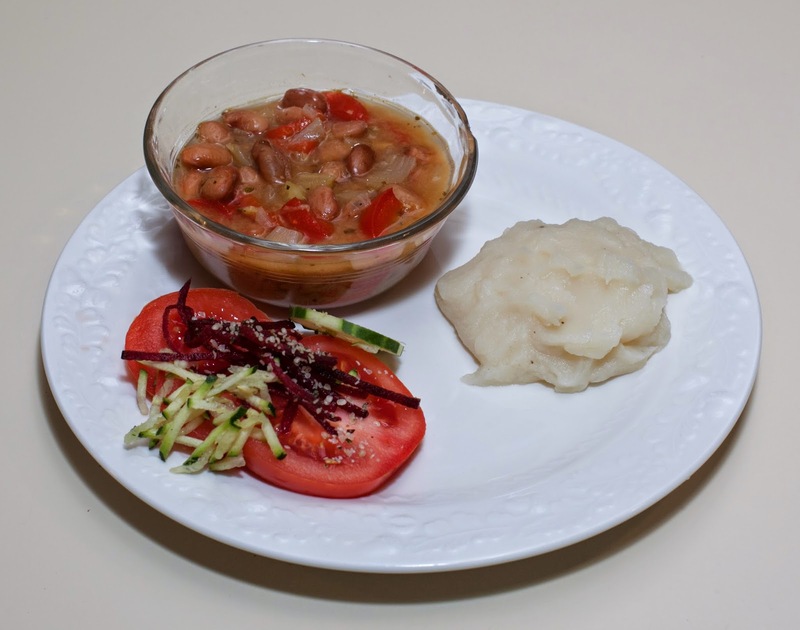 I like the hearty taste and heft of cranberry beans! The main course would have benefited from some jalapeno (but my daughter then wouldn't have eaten it; my wife and I added some hot sauce at the table) and ginger (but my Dad wouldn't have eaten it then). I wanted the fennel to be subtle, and it was - a bit more could have been used. The rice was, of course, great! I would add maybe 2 chopped cloves garlic in the first (for a mild flavor) or second (for stronger flavor) pressure cooking, and perhaps 1/4 of a jalapeno cut into 1/4" slices in the second pressure cooking. A few more vegetables could have added to the flavor, such as perhaps pumpkin, squash, or sweet potato. Maybe some capers or even a bit of diced olive added at the end could have been nice. The rice was good - the nutritional yeast was a good addition!